It's been a busy week and I haven't blogged anything that I wanted to. Phooey. I'll tell you what I have been doing, though. When the days get too crazy and the whining is too loud and the body noises are deafening, I like to escape from it all by researching the best prices on beach vacations to Mexico. Do we have the money to do this? Can my husband get the time off work? Does it make me feel better just to pretend it might happen? Via Dreams Resorts ~ the best! This week I was reading Joyce's blog and admiring her fancy new mailbox. Then I was reminded of the fact that I do not have a fancy mailbox. I have a $10 mailbox I bought 8 years ago when we moved in, and for some reason or another there is a little hole in the mailbox door. Now, I don't know how they do it, but somehow bees manage to squeeze themselves through that little hole. Sometimes there's one in there, sometimes there's not. It's a little like playing Russian Roulette when we retrieve our junk mail. I've gotten used to the inherent risk involved, but I'm not sure if my mail carrier can say the same. One time she put duct tape over the hole, but I think the bees ate it. Sign Boy has been at it again. Remember when Haydn labeled the chair after he washed it? Well, this week he spilled some water and he wanted us all to be safe. He has had a need to label things ever since he learned to write. I'm thinking he either has a future in advertising... or road construction. My husband and I recently started playing Words with Friends on our phones. It's fun because he very rarely answers my text messages, but he never misses an opportunity to spell 'jeer' on a triple word space. So now we are having some interaction during the day while he's at work. Sometimes we even lie in bed right next to eachother and play it. Just like Mr. and Mrs. Brady. 'Cept Mrs. Brady probably never said "I'm gonna kick yo' tail, sucka foo!" Speaking of my husband, last week while we were on vacation, we took the boys on a hike. Then I thought it might be fun to hand Jarrod the camera so he could take some photos with me in them. Would you like to see the amazing, lovely and sentimental photos my sweet landscaper husband took? Nothing says 'I love you' quite like photos of native vegetation. I think I have the only four-year-old on the planet who will bring me his bowl of ice cream half full and say "Mama, I'm done now." "No thanks, my belly is still full." At first I thought something might be wrong with him, then I realized something is actually wrong with ME ~ he's displaying self-control, and I just can't wrap my brain around it. Okie dokie, my friends~ that's all I have for tonight. In the next few days I'm planning to share about our vacation, my little mister turning four, and a recipe for an easy kid-friendly lunch. 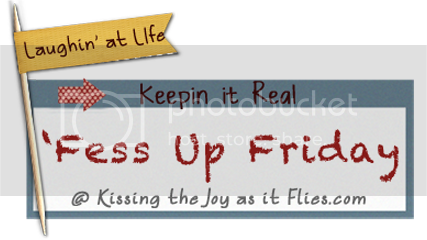 And don't forget, if you've written a 'Fess Up Friday post, come link up with me! Jarrod taking native landscaping pictures instead of you KILLS me! ha! So funny. I've experienced the same thing with David and WWF. It's the only way he will talk to me during the day! But, he cheats! There's an app for cheating. Love sign boy, too. So cute. I agree with Taylor, the landscape pictures cracked me up. It is kind of embarrassing when I have to hand my camera over to Matt and say PLEASE take a picture of ME so that when the kids are older they will know they had a mom. :-) The pictures are usually so bad though that no photo editing can help....if I can skip my cookie diet and actually do something real this MAY help the pictures to turn out better! I hear ya, girlfriend. I took out some dough last night and I was just going to bake two for myself. But then I thought "I better make a whole dozen so that there will be leftovers for the boys tomorrow... they will be so excited." Then when they were done, I ate my two... and then two more. I could take a lesson from Rowan on how to say "my belly is full. I don't need any more." Blah. Okay, I have, but I only use it for emergencies! LOLLL Bummer about the family robot falling on the wet floor (I LOVE LOVE LOVE kid drawings!) and the gorgeous vegetation pictures! I should look into that word game. We have old school Bananagrams, and Mr. Measure kicks my rear EVERY. SINGLE. TIME. He prefers words like GLEANED and REGISTER over my words of cat, it, had, and mop. We had our own version of critter Russian Roulette due to a hole in our garbage can! The squirrels here are amazingly bold! They drag trash all over the yard and even ate up our pumpkins right off our porch last fall!! I'm dreaming of a lovely get-away as well. I love your blog. I identify with you SO much! Mexico vacations are worth every penny. I am praying you get one. Some how, some way. Just you and your man. It is a beautiful thing and really great for a marriage!